I am beyond thrilled to share that Debbie Marcinkiewicz of Paper Sweeties is doing a Designer Feature with me today on the Paper Sweeties blog. Debbie graciously sent me some of her fabulous stamps and dies to play with. I will tell you that they stamp beautifully on the first impression. I love her hand drawn designs. I had the March photo to use as my inspiration for my projects today. For my first card I embossed images that I stamped onto crdstock and patterned paper with white embossing powder. I wish my camera could have captured the shine of the embossed lines and the shimmer of the Wink of Stella. 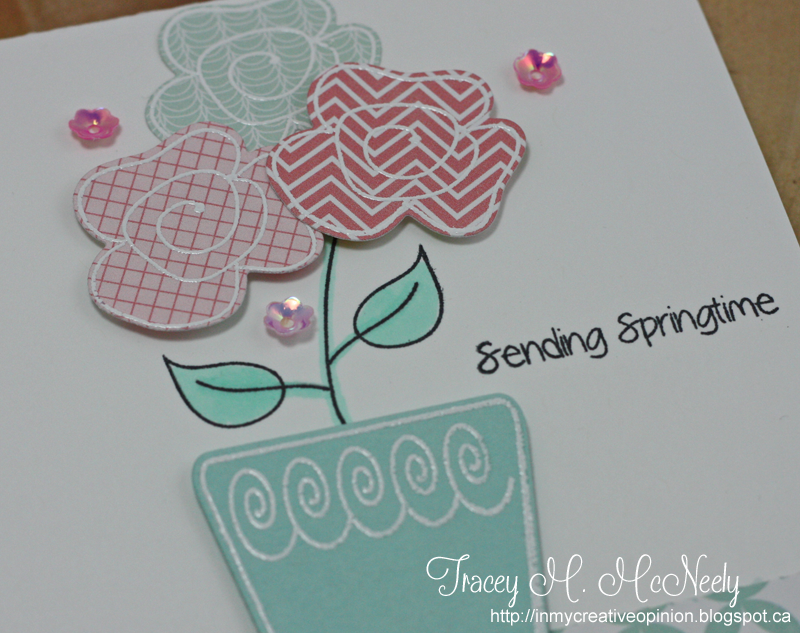 I used the Pretty Posies stamp set and Sweet Cuts, the Garden Time stamp set and Sweet Cuts as well as the Sending Springtime stamp set for this first card. I added some of the new Spring Peeps Sequins and just a touch of Copic on the stem. For my second card I used the Home Tweet Home stamp set, some Copic colouring and again added some Spring Peeps Sequins. Thank you so much Debbie for doing this feature. I am also submitting these to Darnell's NBUS Challenge #4! Congratulations on the feature. I love how you used the stamps and the flower sequins Tracey. Love those embossed flowers and pot on the dp. Two adorable cards. Love the white embossing on the patterned paper Tracey. These are gorgeous! LOVING the Spring colors!!!!!! Two sweet cards (no pun intended) Tracey. I forget about stamping on patterned paper but those flowers look fabulous like that. Very pretty cards, Tracey! Congratulations on your feature. Congratulations on the designer feature. Your cards are great. I love the various paper pieced flowers and the sentiment on the house card is sweet. Darlng cards, Tracey! Love your patterned flowers on the first one, and who doesn't love a birdhouse, especially at this time of year! Congrats, Tracey! These are ADORABLE! Love! Just adorable...I love the look of embossing on patterned paper, Tracey... especially because I don't have Copics! Love that you're being featured today and that fabulous sentiment on card two! These are both just adorable Tracey! I love the white embossing on the patterned paper! These are both adorable. So very sweet. Congratulations on being the featured guest designer. Those doodle flowers are awesome and they look so cool on the patterned paper! Lovely sentiment on the second card and those little flower shaped sequins are so fun! Tracey, these are just adorable. Love those little flowers. Congrats on being featured guest designer. Oh my both these cards are oh so pretty. 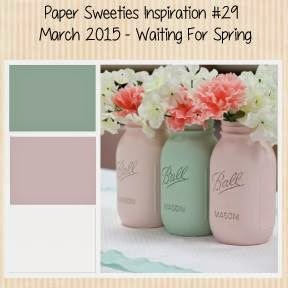 Love the springy colors and the stamping on pattern paper is gorgeous. 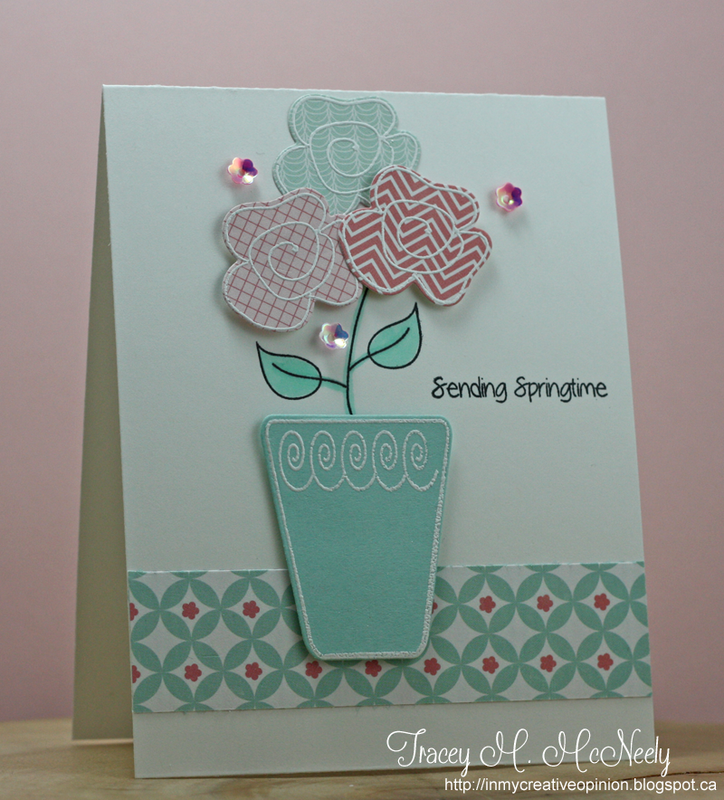 Congrats on being featured Tracey - love both cards - the colors are just the best for that wonderful spring feel! So fun to see you playing with Paper Sweeties! You did a beautiful job - love the pretty flowers in the patterned paper! Congrats on the feature! Both cards are fabulous, Tracey! I love the embossed images and polished look (as always)! You rock this guest design feature! Congratulations on the feature Tracey. You've shown the images beautifully! Congrats Tracey, I'm SO HAPPY for you!! I love this vase of whimsical flowers, such a sweet card!! And this birdhouse is cute, the flower sequins set it off nicely! Congrats on your well deserved Designer Feature, Tracey! I absolutely LOVE how you played with these charming stamps and dies...your cards are so pretty and your Copic coloring is perfect! Love those cute little sequins, too! These cards are adorable. really like the colors that you used! Congratulations, Tracey! Such beautiful uses of these images! Love the embossing and your sprinklings of those darling, floral sequins! Great job! Congrats Tracey!!!! Love what you created using Paper Sweeties stamps and dies!!!!! Your cards are always amazing!!! Applauding your feature - and cheering the darling cards you've created! The flowers are ultra sweet with their little swirls; the birdhouse, totally charming! Impressive!